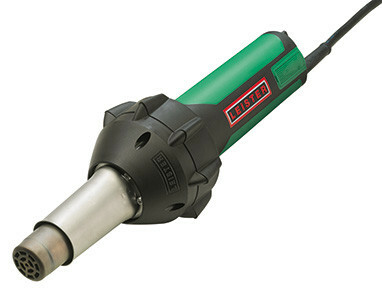 The new Triac ST from Leister is primarily used for welding and processing plastic. During its development, a deliberate choice was made to do without extra technical features. Instead it is distinguished by handiness, reliability and versatility. Like its predecessor the Triac S.
Ergonomic Handling: The 2 component handle and perfect tool balance ensure ideal grip and optimum working even under the toughest conditions. A Real Lightweight: Weight less than 1kg/2.18lbs, the Triac ST is even light than its predecessor. Design Meets Experience: the Triac ST is altready the 7th generation of the revolutionary Triac hot-air tool range from Leister. Decades of experience packed in a modern design.